Hussle was shot to death March 31 while standing outside his South Los Angeles clothing store, not far from where he grew up. 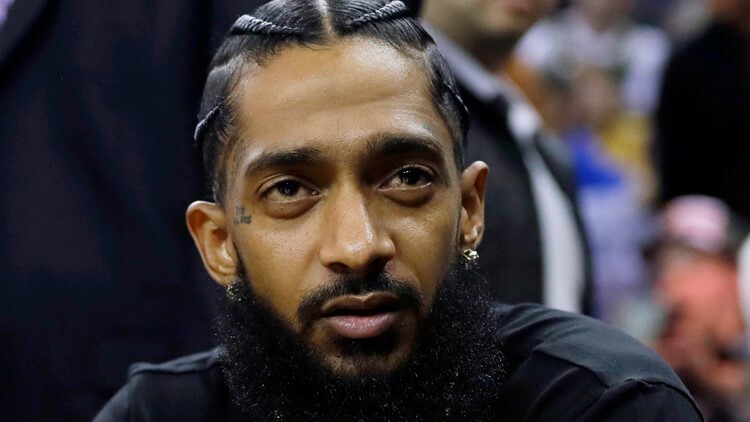 LOS ANGELES — Fans are mourning Nipsey Hussle at a public memorial held at the Staples Center in Los Angeles. The Nipsey Hussle Celebration of Life ceremony started at 10 a.m. on Thursday. It was livestreamed on BET News' Facebook page. The memorial started with a reading from scripture and a slideshow of photos set to Frank Sinatra's "My Way." Pastor Reid Rich linked the rapper to the biblical figure Joseph before the photo montage started. The ceremony will feature performances by Stevie Wonder, Jhene Aiko and singer-songwriter Anthony Hamilton. The hearse carrying rapper Nipsey Hussle leaves Staples Center after a memorial service in Los Angeles, Thursday, April 11, 2019. 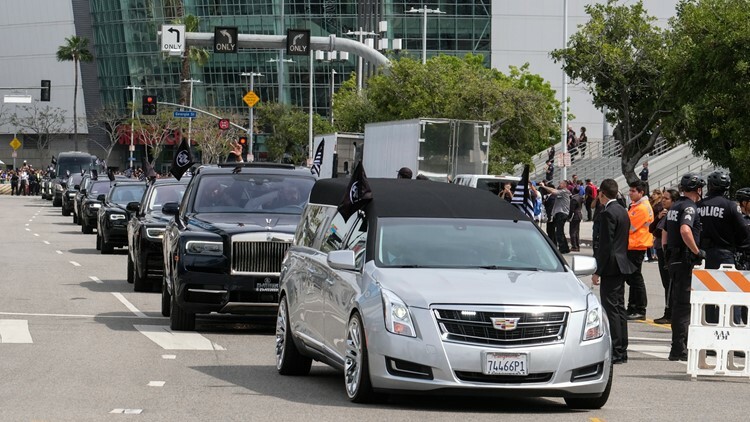 It was followed by a 25-mile procession of Hussle's casket throughout the city, including the South Los Angeles neighborhood where Hussle grew up and was trying to improve, with his clothing store The Marathon an anchor of his redevelopment efforts. The 33-year-old Grammy-nominated rapper was a father of two and was engaged to actress Lauren London. A letter from former president Barack Obama extolling the virtues of Nipsey Hussle has been read at the slain rapper's funeral. The letter from Obama said he had never met the rapper, but had "heard his music through my daughters" and he later learned about Hussle's transformation and efforts to transform his South Los Angeles community. 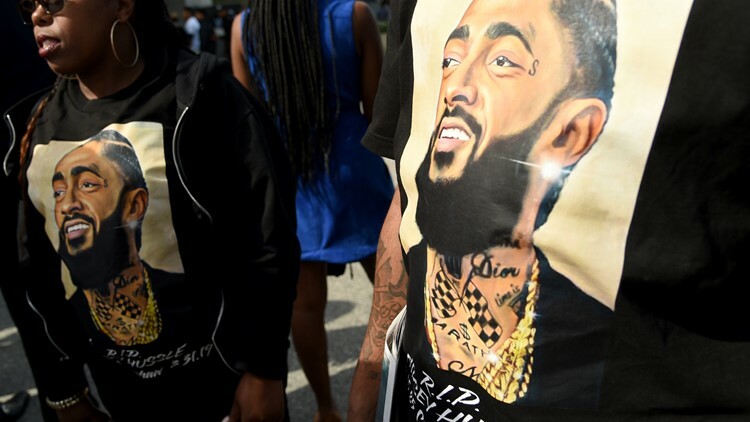 Guests wear t-shirts in tribute to Nipsey Hussle, whose given name was Ermias Asghedom, at the late rapper's Celebration of Life memorial service on Thursday, April 11, 2019, at the Staples Center in Los Angeles. He praised Hussle's vision, saying the rapper and community activist saw potential and hope in the Crenshaw neighborhood he grew up in and that lured him into a gang as a young man. Obama's letter states that Hussle "saw a community that even through its flaws taught him to always keep going." The letter states Hussle's legacy is worth celebrating and Obama says he hopes Hussle's efforts inspire "more good work in Crenshaw and communities like it." Eric R. Holder Jr., who is charged with killing Hussle, has pleaded not guilty. This March 29, 2018 file photo shows rapper Nipsey Hussle at an NBA basketball game between the Golden State Warriors and the Milwaukee Bucks in Oakland, Calif.